What on earth would GMO have to do with Antibiotic Resistance? Here is the answer. 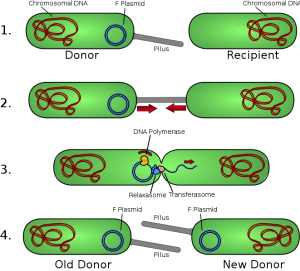 When a gene X is needed to be inserted into the target organism cell, it is done by tossing the isolated desired gene X into the pool of the target organism cells. Next, this pool is “shocked” by various methods (with heat, mostly) to get the cell membranes to rupture, thus hoping that the gene X will get into the inside of the target cell. In most cells it doesn’t happen, so there is a need to get rid of the cells where the gene X did not make it into the target cells. It is done by adding antibiotic resistance genes to the gene X. After the cell pool is “shocked”, next step is to treat the cell pool with the antibiotics. All the cells that did not receive the gene X will now die, and only the cells where gene X is now a part of it will survive being treated with antibiotics. When the target organism, usually a plant, is consumed, the cell membranes break up and the DNS is exposed to the digestive track, where the bacteria exchange their genetics by physically touching each other (called bacterial conjugation). As a result, other bacteria in the body become antibiotic resistant. Please also read the “Process of making GMO is not safe” post to learn more about the GMO making process. « Overview of the artificial sweeteners in the US.